After a pair of fraught 0-0 draws with South Africa and Iraq, Brazil seem to have settled into their stride with a 4-0 win over Denmark and a 2-0 win over a very physical Colombia side. Rogerio has opted for a 4-2-4 formation in the last two games and he will probably be minded to do the same against Honduras, who are likely to try and play on the counter attack. Brazil’s goal has yet to be breached during the tournament, but none of their opponents have truly tested the chin of Brazil’s back 4 just yet. South Africa and Iraq carried a threat on the break, but largely sat deep in numbers. Denmark attempted the same approach with little success, Colombia became so bogged down in disrupting Brazil through rotational fouling and provocation that they forgot to try and attack Brazil. Nevertheless, Rodrigo Caio and Marquinhos enjoyed solid performances at centre half, with their partnership finally beginning to show signs of telepathy. Which is just as well really, because goalkeeper Weverton still looks like a bag of nerves in the Seleção goal. Honduras are likely to adopt a defensive approach, which Brazil should be very accustomed to by now. Their opponents defeated Korea in the quarter-finals with a surprise 1-0 defeat. In that match, Honduras defended in numbers and looked to break at speed. This being the case, Rogerio will probably opt for the 4-2-4 system that has yielded 6 goals in their last 2 games, with Luan linking the play between the midfield and the magic triangle of Neymar, Gabriel Barbosa and Gabriel Jesús. Luan has been key in Brazil’s revival since matchday 2. Prior to his inclusion in the starting line-up, the front 3 were marshalled into congested areas far too easily. But Luan operates more centrally and knits the attack together. He either draws defenders, leaving space for one of the front 3, but id defenders back off and elect to stay with their man, he is more than capable of inflicting the damage himself. His goal against Colombia was an apposite example of this, picking the ball up in a central area and unleashing a dipping shot from 25 yards. Neymar’s move into more central areas has also freed Gabriel Jesús. The Palmeiras man cut an isolated figure in the opening two matches. He expressed his frustration following the draw with South Africa, complaining that he had been asked to stay in the number 9 position and not involve himself in the build up play. Against Denmark, Neymar moved from the left to the centre. In doing so, the skipper was able to move from inside to out and team up with left-back Douglas Santos and Jesús found more joy moving from outside to in from the left. Rogerio opted for the increased energy and steel of Walace in central midfield ahead of Thiago Maia against Colombia. Thiago was possibly Brazil’s best player in the opening two matches, but with a more open midfield structure, Walace’s dynamic qualities provide a superior fit. Renato Augusto will likely get the nod in the number 8 role ahead of Rafinha. Zeca, Rodrio Caio, Marquinhos and Douglas Santos should complete the back four, with Weverton retained in goal. Neymar is expected to shake off an ankle injury to play. Brazil will again be hot favourites for this match after a bruising encounter with a gifted young Colombian side. 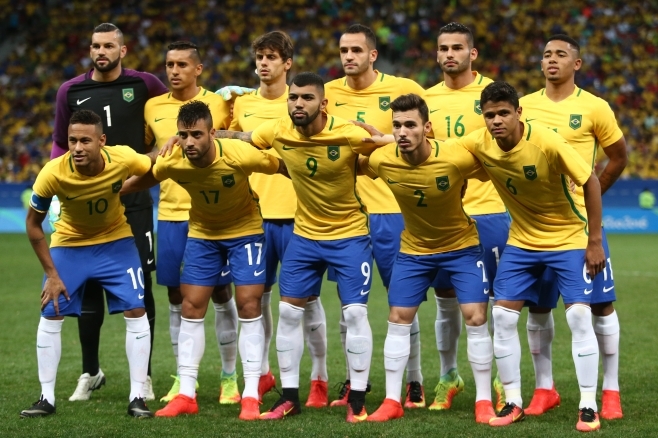 Now that a medal is in sight, it will be interesting to see how the Seleção cope with the pressure and expectation. It seemed to suffocate them early in the tournament before the thrashing of Denmark made the air feel a little lighter. But with a final in sight, that sense of pressure and expectation will crank up again. Despite a few flashpoints, Brazil stood up relatively well to Colombia’s aggressive tactics- how well they master their nerves in Rio will go a long way to deciding their fate against the unfancied Hondurans. Predicted line-up: 1.WEVERTON (Atlético Paranaense), 2.ZECA (Santos), 3.R.CAIO (São Paulo), 4.MARQUINHOS (PSG), 6.DOUGLAS S. (Atlético Mineiro), 12.WALACE (Grêmio), 5.RENATO A. (Beijing Guoan), 7.LUAN (Grêmio), 9.GABRIEL B. (Santos), 11.G.JESUS (Palmeiras), 10.NEYMAR JR. (c) (Barcelona). Score prediction: BRAZIL 2 – 0 HONDURAS (Neymar, Luan).